are using. 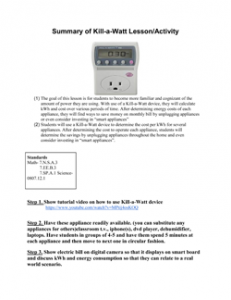 With use of a Kill-A-Watt device, they will calculate kWH and costs overt various periods of time. After determining energy costs of each appliance, they will find ways to save money on monthly bill by unplugging appliances or even considering investing in “smart appliances”.